Can’t Remove WebCompanion? This page includes detailed WebCompanion Removal instructions! 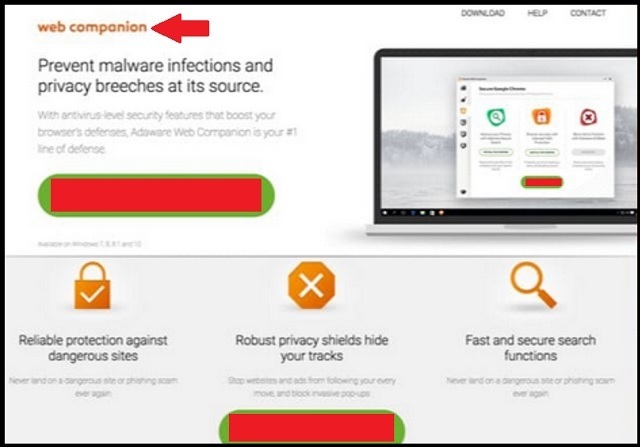 WebCompanion claims that it can protect your computer. Its promises, however, are false. The app is unwanted. It is malware which falls under the PUP (Potentially Unwanted Program) category. There is nothing potential in the situation, though. You don’t want this PUP! It is intrusive, meddling, and quite hazardous. Once WebCompanion gets on your system, it detects and corrupts all installed web browsers. Chrome, Firefox, Edge, Opera; there is no immune program. The PUP alters their settings and throws you in a whirlwind of reshuffles. It changes both your homepage and defaults search engine. It is also quite likely to install unwanted toolbars. And it doesn’t stop here. These modifications are the start of an invasion. The PUP takes control of your browsers and starts an ad-bombardment. It injects various in-text and banner ads on every website you visit. Even web pages that used to be ad-free get heavy on coupons and discounts. No ad-blocking tool is powerful enough to stop the adverts. Pop-ups and push-up notifications cover your screen every time you as much as touch your browser. WebCompanion doesn’t miss an opportunity to interrupt you with an advertisement. This aggressive advertising has its price. It takes a toll on your device. The PUP slows down your system, as well as makes your browser unstable and prone to crashes. And that’s not even the tip of the iceberg. Not only does the PUP flood you with adverts, but it also monitors your online actions. That’s right. The parasite collects information about you and sells the data to unknown third parties. Do not put up with this situation. Protect your privacy; remove the PUP before it gets you in trouble. How did I get infected with WebCompanion? WebCompanion uses trickery to reach its victims. It relies on misleading language and deceptive visual to lure you into clicking on that “Accept” button. No, that’s not a bad joke. The PUP needs you, the user, to approve its installation. No permission, no admission. If you, of course, are not vigilant, you may overlook the red flags and give this parasite the green light it needs. The sneaky PUP hides behind software bundles and fake updates. It lurks in the shadows and waits for you to make a mistake. Do not give into naivety. The PUP is bound to ask, but it doesn’t to it directly. The devil hides in the fine print. WebCompanion preys on your carelessness. Do not make its job easier. Your vigilance can prevent this parasite from infecting your computer. Don’t visit shady websites. Download software from reliable sources only. And, of course, pay close attention to all installation processes. More often than not, the apps we download off the Web come bundled with “bonus” software. The extras, as you can imagine, are often parasites. You can prevent the unwanted bonuses from installing under the advanced/custom/manual setup option. Make sure you un-check and deselect all unwanted apps. And don’t skip the terms and conditions. If you cannot spare enough time to go through the whole document, scan it with an online EULA analyzer. Stop the installation if you notice anything suspicious. WebCompanion is a complete and utter menace. This parasite sneaks into your computer and throws you into a whirlwind of adverts. The PUP uses every opportunity to throw an ad at you. Whether you browse your favorite website or watch a video, the PUP is always there to annoy you. It runs in the background and is always ready to interrupt you with an advert. The parasite, of course, doesn’t stop just here. It is not limited to ad-displaying only. WebCompanion has one other core task: it studies your browsing habits. The PUP records and analyzes your every online activity. It knows your every move. Which websites you visit, when you go online, what videos you watch, what links you follow, where you share information, etc. Do you think that ends well for you? The PUP sells access to the collected data. Anyone willing to pay can use the information to target you. Hundreds of crooks use the PUP and its resources. They create customized ad campaigns to manipulate and mislead you. The crooks show you what you want to see, but when you click, bad things happen. Do not risk falling into an online trap. Spare yourself many future headaches; remove WebCompanion ASAP! The sooner you delete this PUP, the better! How Can I Remove WebCompanion? If you perform exactly the steps below you should be able to remove the WebCompanion infection. Please, follow the procedures in the exact order. Please, consider to print this guide or have another computer at your disposal. You will NOT need any USB sticks or CDs. Locate the WebCompanion program and click on uninstall/change. To facilitate the search you can sort the programs by date. Review the most recent installed programs first. In general you should remove all unknown programs. Navigate to C:/Program Files and delete WebCompanion folder. Double check with any antimalware program for any leftovers. Keep your software up-to date! WebCompanion may have the ability to replicate itself, if not completely cleaned. This may require tracking down hundreds of files and registry keys. You can choose to use Spyhunter Professional Anti-Malware Program to deal with any infection that might be lurking along with WebCompanion! This article was published in Removal and was tagged Potentially Unwanted Program. Bookmark the permalink for later reference by pressing CTRL+D on your keyboard.